Installation FromUSBStick 這是最快速建立 Ubuntu Cloud 的方式,你不需要了解基礎架構,就只有單一個 Node.開始吧!! 基本上就是透過 USB flash drive 安裝一個 Ubuntu Cloud 系統,接下來再透過這個 USB flash drive 去啟動系統,我們就可以開始使用 Ubuntu Cloud 了,當然也可以透過CD ,但還不確定是不是可以透過 Ubuntu Live CD 一樣從 PXE 來啟動系統,目前我們需要下列幾個步驟. 在 Ubuntu 官方網站大約有 3種 ISO 檔可以供下載. 其中 Cloud infrastructure 才是我們這一次要使用的其 下載點 ,目前版本為 Ubuntu Server 12.04 LTS for Cloud,下載下來後需要將這 ISO (ubuntu-12.04-cloud-live-amd64.iso)轉到 USB flash drive,不管你使用的系統是 windows , Mac OS X 還是 Linux 下都可以找到相對應的工具. Virtual Clone Drive, Microsoft Virtual CD-ROM Control Panel , WinImage 或是其他 ISO 讀寫工具. 實際使用了 winimage 來安裝 Ubuntu Cloud 卻發現轉換好的 USB flash disk 卻在 BIOS 下無法設定為開機裝置,可能格式化後有問題 BIOS 無法認出開機模式,所以將此一 USB flash disk 剔除在開機選單內. 透過 $apt-get install 去安裝 usb-creator 或是 UNetbootin等工具! 我們需要至少 2GB USB flash drive,因為裡面的資料都會毀掉,所已請先備份好你的資料.接下來的示範以 Ubuntu 環境下完成可開機的 Ubuntu Cloud USB flash drive. Ubuntu 預設是沒安裝 ISO 轉換工具 usb-creator 或是 UNetbootin,我們必須透過 $apt-get install 去下載檔案,這邊我使用的是 usb-creator-gtk,下載後直接執行 usb-creator-gtk. 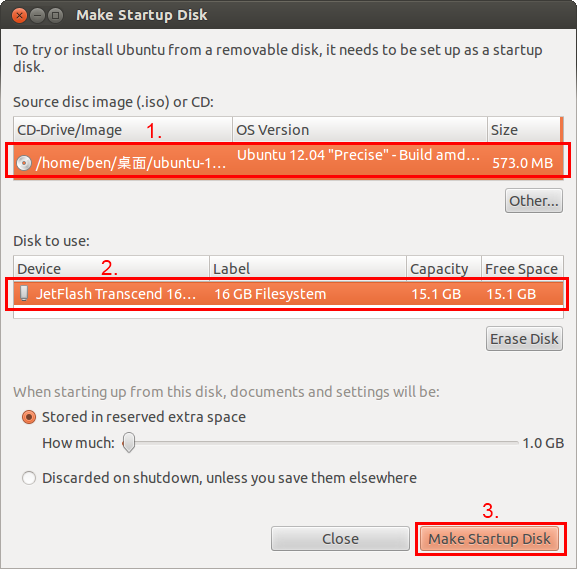 現在使用這usb Flash disk 開機,如果正確無誤系統會開到 ubuntu 的桌面系統. 雖然環境已經有了,但還需要初始過 OpenStack 才可以使用,在安裝好的系統桌面有個說明檔 "GettingStarted.txt" ,接下來就按照說明檔內容來設定.系統提供了 Nova 環境設定檔,所以我們可以很簡易透過一邊寫好的腳本檔案來設定 MySQL data base 等資料. nova-setup.sh 這個檔只是個 腳本 (script) 檔案所以我們可以看一下他的內容,大致可以看到是和 Mysql 相關的設定,基本上系統沒有錯誤發生時,該執行檔不會產生任何信息,等待數秒鐘的執行時間並且沒顯示任何錯誤信息,該步驟就大功告成. mysql -uroot -p$MYSQL_PASS -e "CREATE DATABASE nova;"
mysql -uroot -p$MYSQL_PASS -e "GRANT ALL PRIVILEGES ON nova. * TO 'nova'@'%' IDENTIFIED BY '$NOVA_PASS'"
mysql -uroot -p$MYSQL_PASS -e "GRANT ALL PRIVILEGES ON nova. * TO 'nova'@'localhost' IDENTIFIED BY '$NOVA_PASS'"
mysql -uroot -p$MYSQL_PASS -e "FLUSH PRIVILEGES;"
接下來就是 IP 的設定, Cloud infrastructure 預設安裝是有圖形介面的,所以當我們要設定網卡只能透過 NetworkManager Applet 設定,不同於 Ubuntu server 版的 Command Line NetworkManager,請自行參考不同的設定方式. 設定好網路之後就可以開始執行 nova 以及 glance 服務. start-openstack.sh 腳本檔會去編輯 /etc/nova/nova.conf 以及設定你的環境,有興趣的可以自行研讀 start-openstack.sh 腳本檔. 本地端預設有一個簡易版的映像檔可供我們直接使用,直接透過 glance 把它加進入成為 Instance(VM: Virtual Machine) 即可. Ubuntu 12.04 LTS 除了將 Openstack 整合到系統中,還進步一步針對 Openstack 推出雲端佈署等功能服務如: MAAS, Juju, AWSOME以及Landscape等 其中的 Juju 將負責軟體服務部署的功能. At this point, the Openstack cloud has been deployed and should be functioning. Point your browser to the public address of the openstack-dashboard node, login using admin/openstack (passwd defined in cfg above) and you can begin using the cloud, adding users, etc. 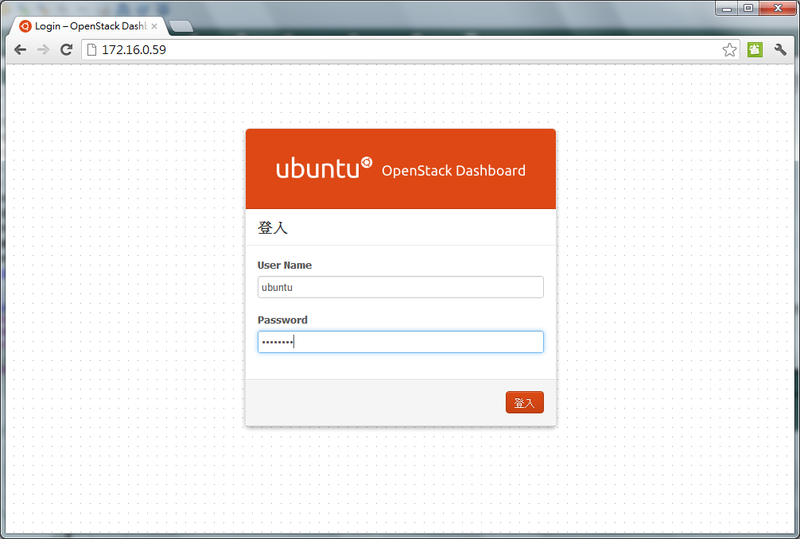 Use the command "juju status openstack-dashboard" to get it's IP address. You can also begin using Juju to deploy services into your new cloud. To generate a Juju environments.yaml entry suitable for use against the new Openstack cluster, select Settings -> Juju Environment Config -> Download Juju Environment Config in the Openstack dashboard. Note that you'll need to update the 'default-image-id' in this file to match the AMI id of an Ubuntu cloud image that you've published (eg, ami-00000002 from above). Launch an instance of cirros image using the web interface. Connect to the instance using VNC (localhost:5900) or over SSH (username: 'cirros', password 'cubswin:)', IP can be seen in the web interface). If you've uploaded Ubuntu image, use web interface to generate keypair, launch Ubuntu instance using generated key and then use SSH to connect to the instance: ssh -i name_of_the_key.pem IP_of_the_instance. Make sure you protect the key file first: chmod 600 name_of_the_key.pem.